American quilts, often made with colorful fabrics and intricate stitching, combine two ancient traditions: quilting and patchwork. These textile treasures capture the attention of many collectors and country decorators. Whether you buy an antique quilt to display in your home or have the good fortune to inherit a an example of this heirloom handiwork – whether made of cigarette silks, cigar ribbons, or other fabric scraps – there are some steps you can take to ensure your quilts are around for generations to come. The best way to display or store a quilt comes through the traditional use of spreading it on an unused bed. The Peterborough Centennial Museum and Archives also suggests covering quilts with an everyday coverlet to protect them when storing them in this manner. However, covering your quilt might defeat the purpose of actually showing it off, so be aware of the main concern with display: light damage. The Rocky Mountain Quilt Museum (RMQM) offers good information on preserving quilts and emphasizes that all light damage is irreversible so avoiding it is paramount. "Both sunlight and artificial light will cause fading," according to RMQM. Light levels should be low in rooms where quilts reside and any bulbs that might damage the fibers with heat should be kept well away from the bed. Should you decide to hang a quilt in your home to display it, plan to only leave it up for six months at a time. If you have more than one quilt, rotating them could be the answer. And, remember to never use nails, pins or staples to hold a quilt on the wall. The best measures distribute the weight over the entire width of the quilt to avoid damage. A good method is hand sewing a four-inch wide tube or sleeve of fabric along the top back edge of your quilt with heavy thread, stitching every inch or so and taking care to sew through all layers of the textile. Then it can easily be attached to a wall with a sturdy rod without harming the fabric. Folding a quilt, especially older more fragile examples, is somewhat risky due to the folds putting stress on the fabric and stitching. 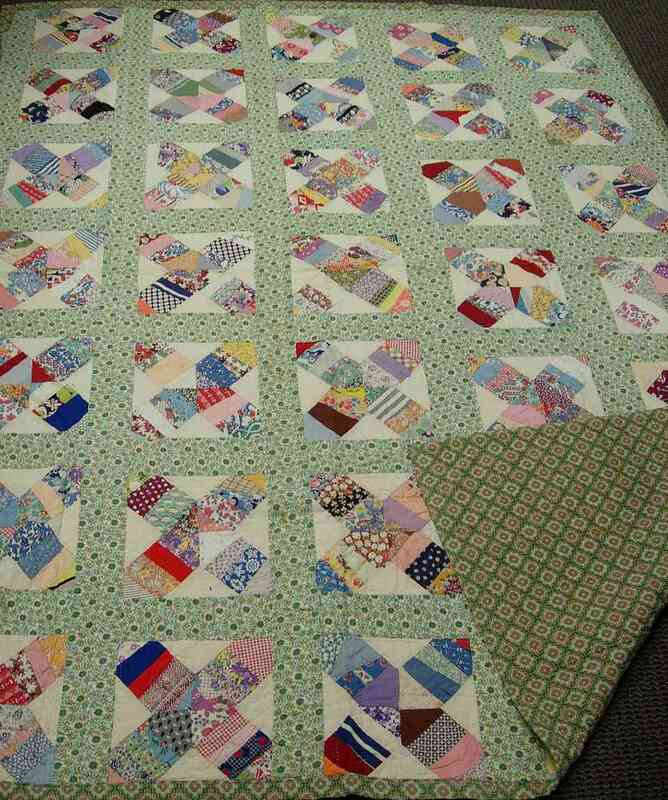 If you decide there's no choice other than folding your quilt for storage, Museum Conservator Barb van Vierzen of the Peterborough facility suggests a specific method. To fold a quilt, spread it face down on a clean, well worn white cotton sheet. Cover the back with the same type of sheet to prevent the folds from tearing. Then, fold the quilt in an accordion pleated fashion. This method takes extra time to accomplish, but provides the best protection for the stitching and fabric. Limited space may also dictate storing the textile under a bed. This can be accomplished using Rubbermaid or a similar container made of rubber. Chemicals used in the manufacture of plastics and cardboard, along with natural substances in woods, can all react with quilting fabrics and cause damage. If reactions occur, they can cause quilts to become fragile, prone to tearing, or even stain them irreversibly. Another important step in preservation is airing quilts if you keep them stowed away. Van Vierzen recommends letting them air once or twice a year by spreading them flat in an area with low light, rather than hanging them on a clothesline or similar apparatus. This also serves as a cleaning method, since it helps eliminate odors naturally. Cleaning quilts should be done sparingly and never with harsh dry-cleaning chemicals. Most of the time, a good dusting will do the trick, although this should never be accomplished by shaking or beating the textiles. Instead, like when cleaning other vintage linens and textiles, place a nylon stocking over the nozzle of a canister vacuum and then gently vacuum in two directions. Between dusting, airing and proper storage methods, most quilts should stay in good, clean condition for future generations to enjoy. However, if more work is needed to clean and freshen a soiled quilt, it's best to contact a professional quilt conservator for assistance.